It's no secret. I love cake. All cake. Lot's of cake. I love making it and I love eating it. I'm not that great when it comes to presentation but I certainly think they taste good! When it comes to baking with Lily, I started early. She was 9 months old and I remember feeling bored and a bit lost about what to do and so I turned to making cupcakes. 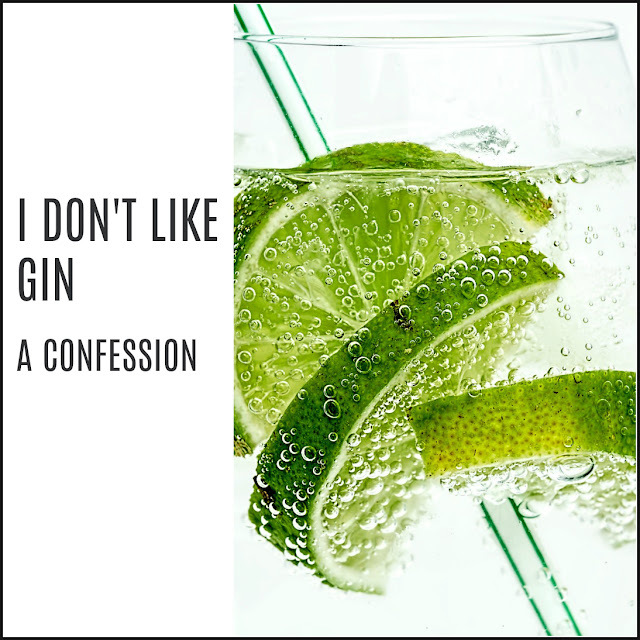 She loved it and it went much better than I ever expected. Since then it has been one of my favourite activities to do with her, and one of her most requested. 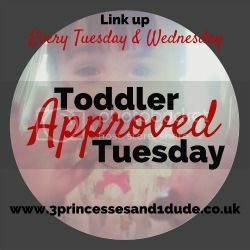 I included baking on Our January To Do List because I knew it would be an easy one to tick off and it went down just as well with Ollie (also 10 months) who threw a proper temper fit when I moved the bowl to Lily for her turn at stirring. Other than that, it was a great activity to do for both age groups. 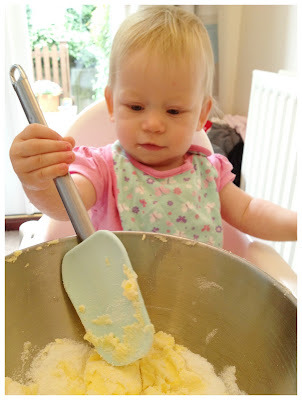 Lily could help with the measuring, pouring, whisking and scooping and Ollie could crash and bang the utensils, help with stirring and make a bit of a mess (not too much, thank goodness). 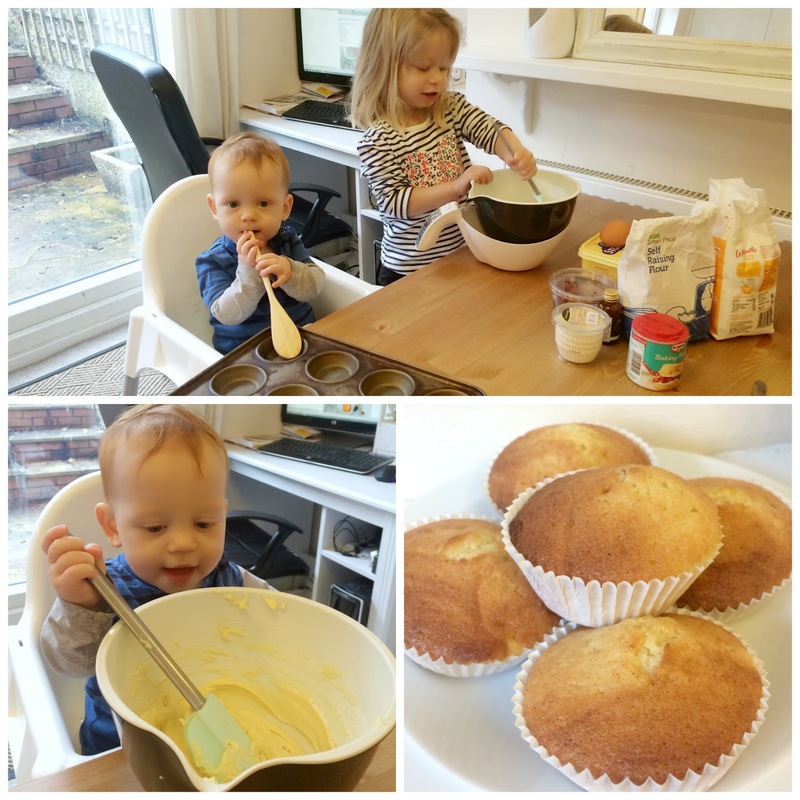 We made simple sponge fairy cakes. The recipe is an easy one that I use all the time for sponge cakes, just scaled down in quantities the way my Mum taught me. If I was making these myself then I'd cream together the butter and sugar first, whisk the egg with the vanilla and then add to the mixture before adding in the flour and baking powder. Pop them in the oven for 15 minutes at 180 degrees. You can tell that they're ready when they're springy to touch or a skewer inserted into the middle comes out clean. Easy enough. But with the kids I tend to let them chuck it all in and the results are pretty much the same. These quantities are for 6-7 fairy cakes as I didn't want a lot of leftovers (which I would inevitably end up stuffing my face with at nap time). 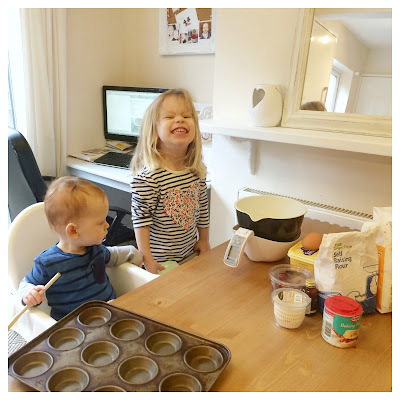 For 12 cupcakes you just double the amount flour, butter, caster sugar and eggs and for a Victoria sponge cake you use 6oz of key ingredients and 3 eggs. When you fancy a change you can make different varieties - this time we added chopped glace cherries but you can also add cocoa powder, sultanas, chocolate chips or mixed spice. If you're feeling particularly creative then you can also ice or decorate them but ours didn't last that long! Lovely to be baking together and they look so happy.